Two members of the Department of Computer Science and Engineering have been nominated for Parents’ Recognition Awards. 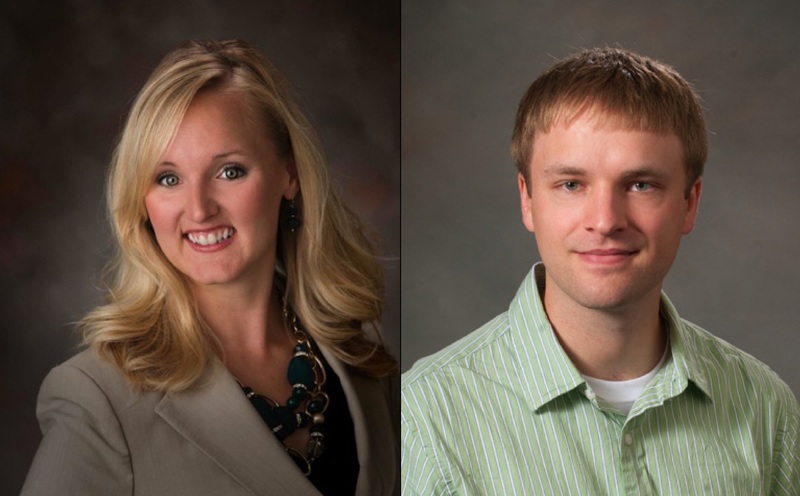 Recruitment and retention coordinator Jenna Huttenmaier and associate professor Carrick Detweiler will be honored at a reception this Friday, Feb. 2. The Parents' Recognition Awards are earned through nominations made from parents of Nebraska students. Presented annually, the honors provide positive feedback to faculty and staff about their work with students. They also encourage good student and faculty relationships and provide recognition in an area often overlooked in the formal rewards system. The Parents Association solicits nominations through an annual mailing, asking parents to nominate a faculty or staff employee who has made a significant difference in their student’s life. Nominations include a short explanation of why this person was nominated. All who were nominated by at least one parent or student and who are still with the university received a certificate. The annual recognition ceremony was organized by the Division of Student Affairs and co-sponsored by the teaching council and Parents Association. Certificates of recognition for contributions to students were given during the ceremony. This is the 30th year Nebraska faculty and staff will receive the awards from the Parents Association. Congratulations to Jenna and Carrick! We thank them for all they do for our students and department.